When it comes to choosing a luxury gift, I always think of a watch as being such a classic and timeless choice. 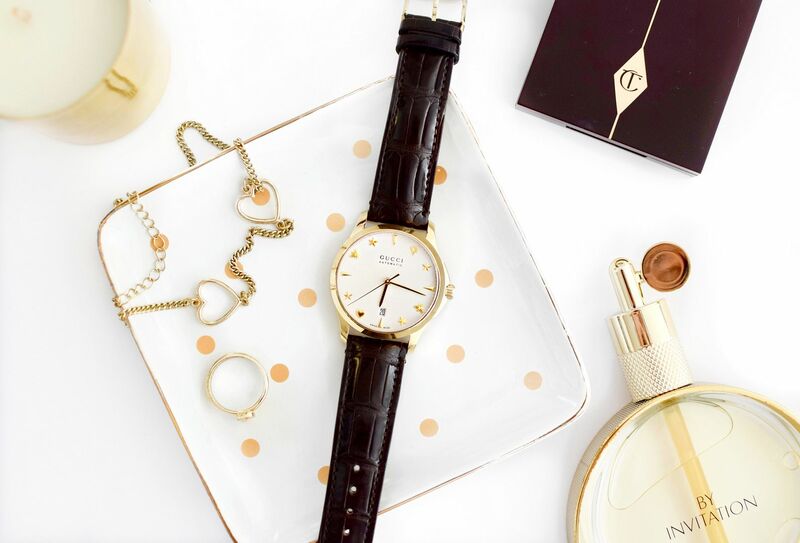 It’s a gift that will always stand the test of time, excuse the pun, but a watch can also be such a personal choice and you want to make sure you are choosing the right one for your lucky recipient. With the help of these beautiful Gucci watches from The Watch Gallery, here are my 5 top tips in choosing a ladies watch as a luxury gift this Christmas. When I was younger I used to always choose a silver cased watch, but now I’m older I seem to be all about the gold. The easiest way to work out which they would prefer is to take a look at the jewellery they normally wear, this should give you a really good indication. Also take a look through their wardrobe if you can and have a think if what you had in mind would go with what they would mostly wear. I love the details of this Gucci watch, it has a stainless steel dial and then inside small gold hearts, bees and stars. This one is great if you are unsure on the silver or gold debate, as it has both and it would be an easy one to pair. Quite a big one to consider is the proportions of a watch to the person. I myself have a very small wrist, so I tend to go for a leather strap, as more often than not I would have to have links removed from a watch to make it fit. The face of the watch is also important, smaller faces and straps would work well for a more petite frame and similarly larger for taller. A watch should match a lifestyle. Are they more of a sporty person? Do they attend any formal events? Do they have more of a casual style? Personally I like a more casual watch for day and then something with a bit more bling for the evening. 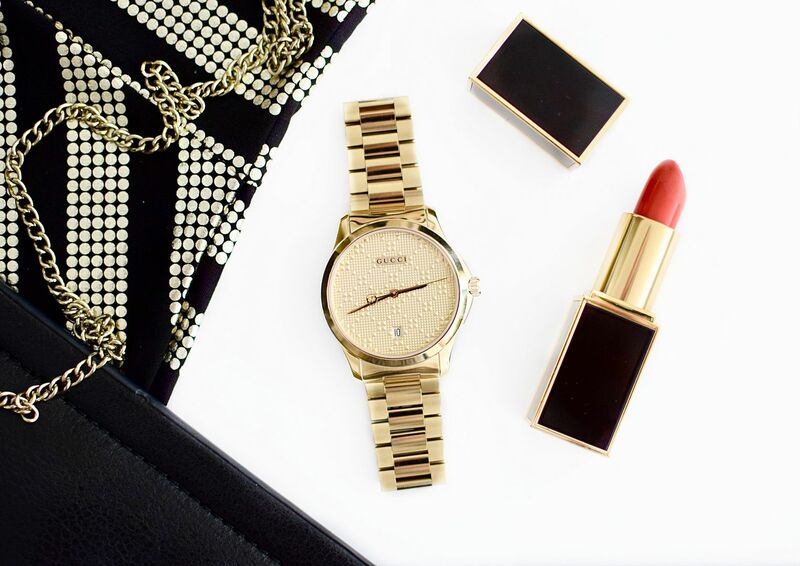 A watch with a bracelet can make the watch more of a jewellery item and something they will wear to compliment their outfit, such as this Gucci timeless watch with gold bracelet and gold dial. You have your own budget for buying the gift, but did you think about how comfortable they may feel? Think whether they would feel comfortable wearing a watch regularly that’s worth more than the average rent. If not, then maybe look at watches at a slightly lower price range. Gucci watches range in price, but have a pretty good price point at most being under £1000. We know your lucky lady loves a little bit of luxury, but do they like logos or branding? If not look for more discreet logos within the watch. 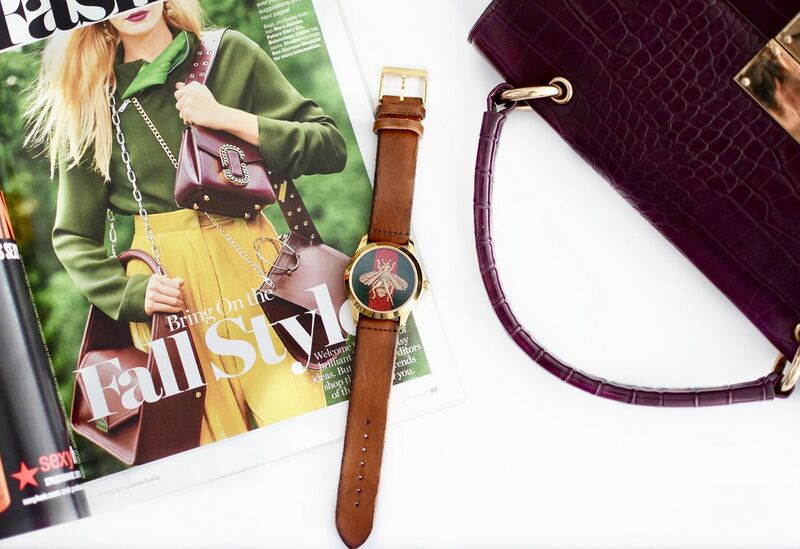 For a bit of both, I love this watch with the trademark Gucci bee and colours. It could be a perfect choice as it doesn’t scream Gucci straight out at you but isn’t as understated as others, that you know it is from the designer. This post was sponsored by The Watch Gallery, all opinions are my own.